We will learn about your involuntary nervous system and manipulate it! Welcome to the autonomic nervous system, its division into the sympathetic and parasympathetic systems, and how it controls heart rate. Here we will activate your sympathetic nervous system using a famous model pain stimulus: dunking your hand in ice water. As you maintain the hand in the ice water and your hand begins to hurt, your sympathetic nervous system "fight or flight" response will activate. This causes your heart rate to increase, which we will measure with our Heart and Brain SpikerShield. Heart Action Potentials - You should have a basic understanding of how to use the Heart & Brain SpikerShield to record your heartbeat. Most of our human physiology experiments have dealt with the voluntary nervous system (Neuromuscular Neuroscience) or perception (Sensory Neuroscience); but here we will talk about the "involuntary" part of the nervous system, the autonomic nervous system. The autonomic nervous system controls things we are both aware and unaware of but generally do not have much control over - digestion, homeostasis, sweating, blood pressure, heart rate, and many others. It is traditionally divided into two systems, the sympathetic division (which activates the coined "fight or flight" response) and the parasympathetic division (which activates the also-coined "rest and digest" response). 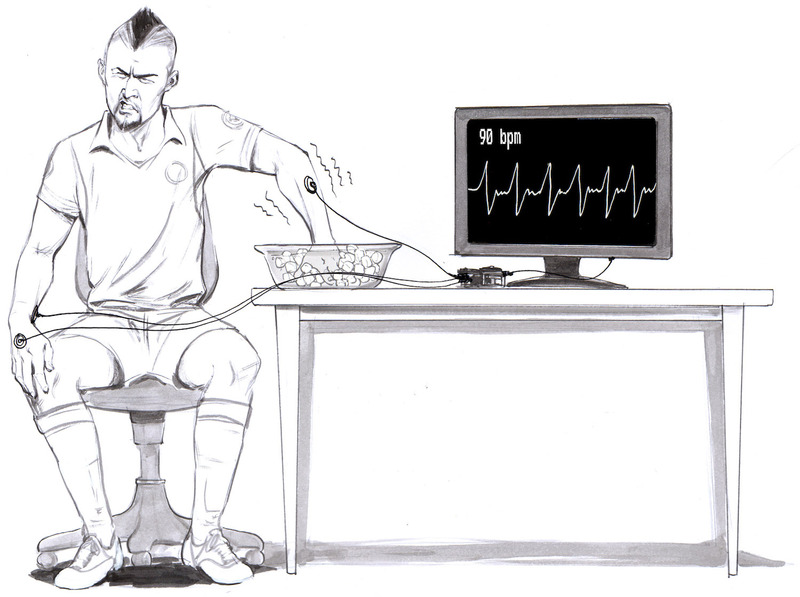 We can study the effects of the sympathetic nervous activation by measuring heart rate. In our previous heart experiment we observed the electrical impulses of the heart and the increase in heart rate during exercise. Let's go a little deeper into heart rate physiology and try to specifically activate your sympathetic nervous system's "fight or flight" response. What happens in "fight or flight?" As you can imagine, if faced with a threat, say, a large shadow moving in the night, the heart rate increases, sweating begins, respiration increases, digestion is inhibited, the eyes dilate, and many other things. Alternatively, the parasympathetic activates the "rest and digest" response, which performs the opposite of all the things listed above (heart rate decreases, digestion activates, salivation increases, etc). 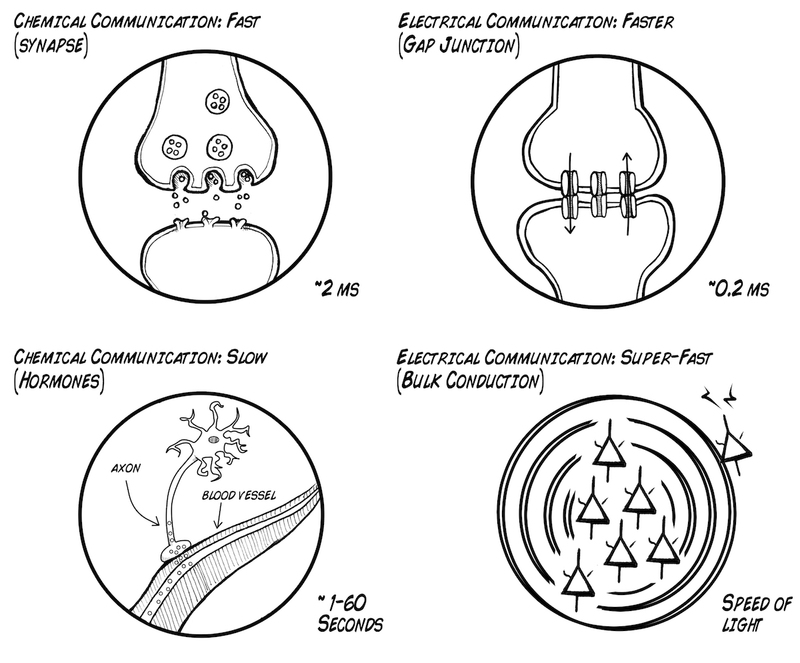 Many of these reactions in both the sympathetic and parasympathetic systems are controlled by hormones, which can be helpful to think of as "neurotransmitters" but that enter the bloodstream instead of the synaptic cleft to find their targets, and instead of response times of 1 ms in the brain, hormones have response times in the scale of seconds to minutes on multiple structures in the body. For example, when the sympathetic nervous system is activated, the pituitary gland, which anatomically branches off of the hypothalamus in the brain, releases Adrenocorticotropic hormone (ACTH) into the bloodstream, increases cortisol levels, causing various physiological changes including heart rate increase. 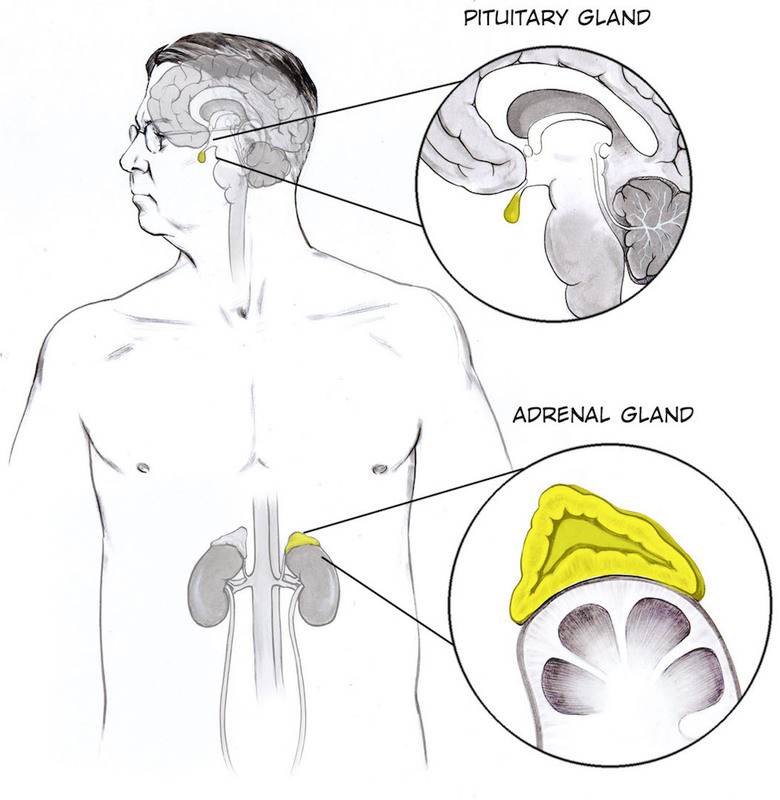 Simultaneously, the adrenal gland, a neural ganglion located on the kidneys, releases norepinephrine and has a similar effect on the heart. To activate your sympathetic nervous system, we will use the famous "ice water" stimulus. This is often used in pain studies as humans can tolerate it, everyone has experienced cold hands before, it is not scary and does not result in psychological damage, and is a a good model stimulus easy to replicate in labs around the world. The longer you keep your hand in ice water, the more painful it becomes, activating your sympathetic nervous system, which will lead to an increase in heart rate. Now let's see it for ourselves! Before you begin, make sure you have the Backyard Brains Spike Recorder installed on your computer. The Backyard Brains Spike Recorder program allows you to visualize and save the data on your computer when doing experiments. We have also built a simple lab handout to help you tabulate your data. Fill a pasta pot or large bucket 3/4 full with ice. Add cold water. Note that you making ice water, not water with ice in it. The ice water will ensure that the mixture is always in equilibrium at 32° F (0° C). Place electrode patch stickers on your upper forearms, and one on the back of your hand. Connect the red alligator clips of your orange cable with the electrodes on your upper forearms, and the ground alligator clip to the ground electrode on the back of your hand. Hook up the orange cable to your Heart and Brain SpikerShield, and plug the Heart and Brain SpikerShield into your computer via USB. 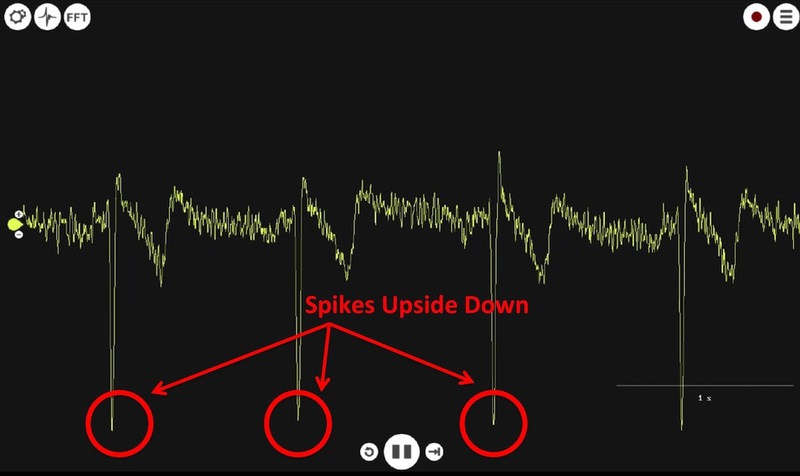 Set up your SpikeRecorder software to begin recording heart rate. This is done by connecting your Heart and Brain SpikerShield to your computer via USB port, turning on the power line noise notch filter of 60 Hz (USA) or 50 Hz (Europe, South America) depending on the country you live in, and the general band-pass filters from 1-100 Hz. Go into threshold mode, click the heart icon, and move the threshold until your can isolate and calculate the heart rate. Note if the electrocardiogram appears weird (upside down), interchange the two red alligator clips to opposite forearms. Have your friend place their hand in the ice water, but leaving the upper forearms exposed so that the electrodes are not submerged. Wait until your friend reports that the stimulus becomes painful enough that he or she can "barely tolerate it." Write down their heart rate. Repeat a number of times to get an average (see handout). If you repeat enough observations, you can do statistical hypothesis testing. While we are set up for this experiment, we also examine another effect on the heart rate, called the diving reflex. 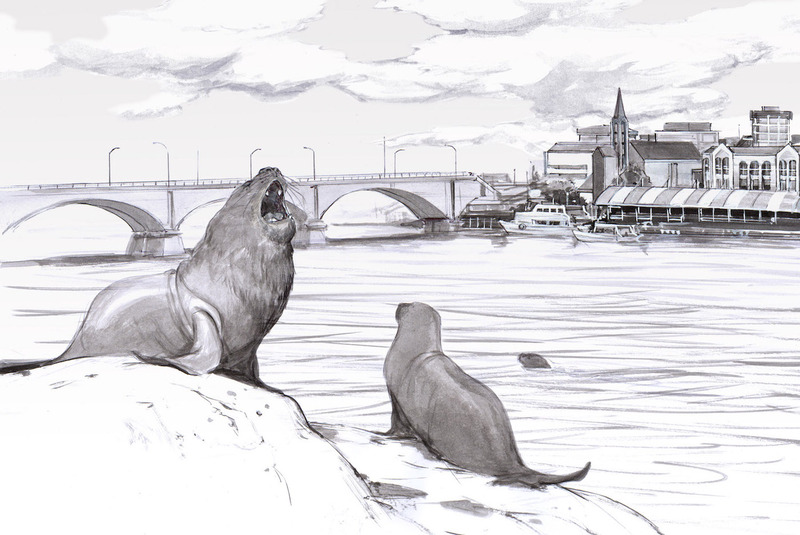 When a seal lion or other marine mammal dives, its heart rate decreases, and the veins and arteries in peripheral tissues and limbs contract. This limits blood flow to organs not related to the dive, reduces oxygen consumption of the heart, and maintains blood flow to the brain. But did you know that this response exists in all mammals, including you? When cold water contacts your face and you hold your breath, we can see the "Diving Reflex" as a decrease in heart rate. We can do variations to separate out the effects of water contact on the face versus simply holding your breath. Dump out the ice water in the pot above and replace it with more tolerable cold/cool water. Record the resting heart rate. Have the subject hold their breath and submerge their face under water for as long as the subject is comfortably able to. Observe the heart rate. Does it decline, and then increase when the subject removes his/her head from the tub of water and begins breathing again? Now have the subject use a snorkel. Repeat the experiments, but have the subject hold his/her face under the water but respiring through the snorkel. 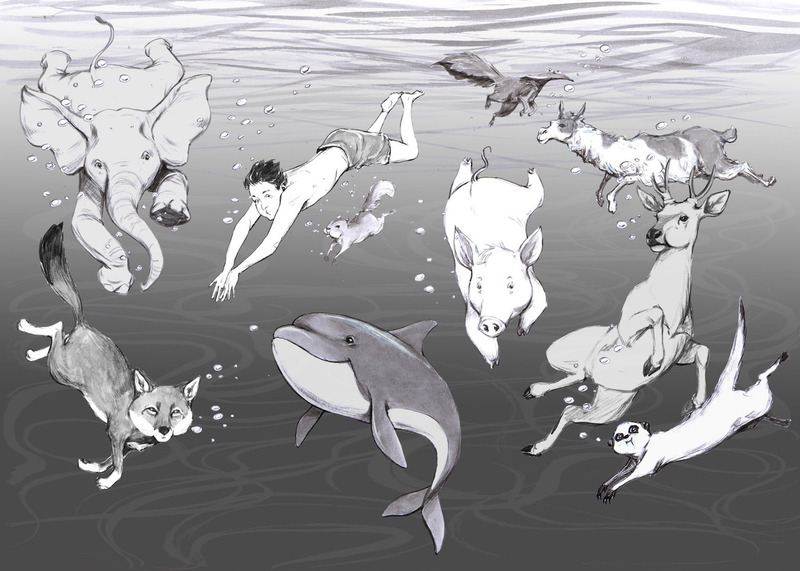 Does the heart rate change in the same way as when the subject was holding their breath under water? Finally, measure the heart rate, and just ask the subject to hold his breath instead of submerging their face under water. You should notice the heart rate go down and then briefly rise again upon return to normal breathing. Was it more or less dramatic than when the face was submerged underwater? We thank our exercise and muscle physiology colleague, Associate Professor Brian L. Tracy for describing this experiment to us during the Society for Neuroscience 2016 conference. 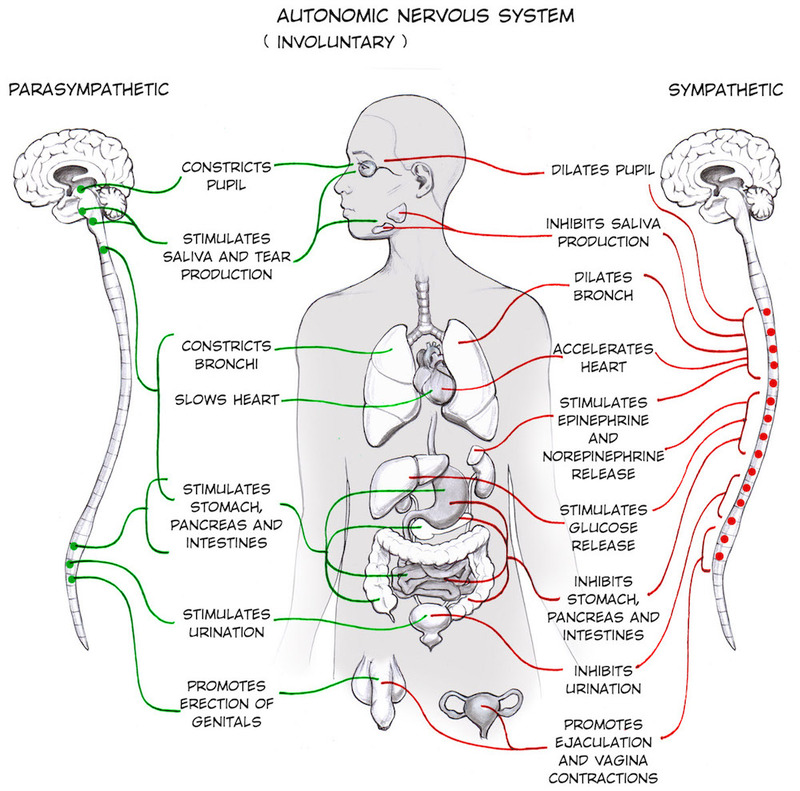 The word "autonomic," meaning involuntary, is related to the word "autonomous," meaning independent. Since these experiments are relatively easy to do quickly, you can rapidly generate a large data set in your family or school. Are there differences between athletes and people with normal or low levels of fitness? Are there differences in age, differences between male and female students, etc. Happy Statistics! We previously studied the effect of exercise of heart rate. Why would or would not this stress response caused by ice increase the heart rate through different physiological mechanisms than exercise?